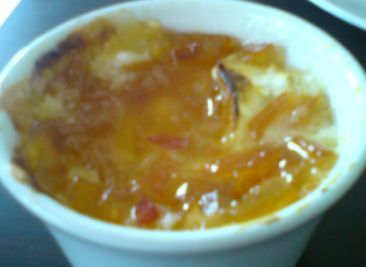 Spread some of the marmalade over a whole goat’s cheese and bake in the oven until the cheese is a little soft. 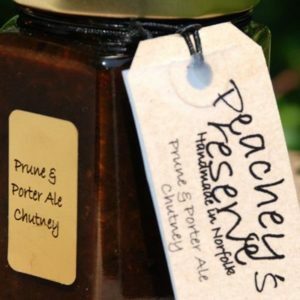 A fabulous winter warming meal for the New Year using local venison and our delicious Prune & Porter Ale Chutney. Heat a small amount of sunflower oil in a roasting tray until slightly smoking. Dust venison joint in flour and seal on all sides. Remove from tray. Roughly chop leeks, carrots and put with whole shallots in tray and fry for a few minutes, stirring frequently so they don’t stick. Remove from tray. Clean roasting tray and place venison in the middle. Scatter the fried vegetables around joint. Pour red wine over the meat. Smear the chutney over the top of the joint and then wrap the bacon rashers over the top and tuck underneath to secure. Cover the tray with foil and leave to marinade for 1 hour. Preheat the oven to 190oc, roast joint for 2 hours, occasionally basting the joint. Reduce oven temperature to 170oc and roast for a further 15 minutes. Cut meat into thick slices and spoon over some of the gravy from the tray. Serve with mashed swede and broccoli.